Curios and Dreams | Makeup and Beauty Product Reviews : Summer Essentials! It's only the start of April and the heat here in Bangalore is almost becoming unbearable. I do not even want to think of the cities that experience hotter temperatures! We will be doing some summer related posts over the next few weeks along with reviewing some products well suited to battle the hot days. 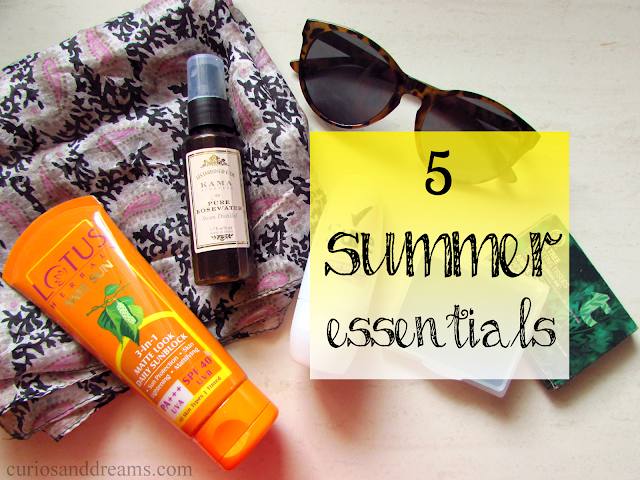 Up today are my Top 5 Summer Essentials and some product recommendations. Take a look! The refreshing feel of a face mist in the middle of a hot summer day cannot be described in words. Pick up a small can/bottle that can be carried around easily. I reach for a face mist a lot during the day during summers. And while I have tried many, plain Rose Water works beautifully. I am especially partial to the Kama Ayurveda one. You could also try the one by FabIndia (which was the older favourite). Again, an important thing around the year, but super essential in summer. Body odour is something one cannot tolerate and thanks to our humid tropical country we are eternally doomed to perspire..a lot! Keep an antiperspirant or a deodorant handy. Try using an alcohol free one, which is more skin-friendly. I highly recommend the Sure Roll On, but you can go for whichever one you like. If you want some recommendations, we have plenty of them reviewed here. Another thing to keep in handy would be a foot odour control spray like this one from Scholl. I have combination skin, and my T zone gets super oily during this time. Blotting sheets are such a saviour in times, when I cannot wash and redo my face. A few dabs and it soaks up all the oil leaving a shine free matte face! I loved the TBS tea tree one (discontinued now). Clean and Clear, Basicare also stock these. I have also picked up a pack from Forever21 recently. Can never have too many of these! I love picking up new ones, but generally get too lazy when it comes to using them. But what better time to flaunt them if not in summer? Keep a good pair handy to protect your eyes. If you have a good number of them, then throw one in each handbag, so you never forget to carry one! The sun damages your hair too leading to discoloration, dry brittle strands,split ends, thinning and frizziness. The cheapest way to protect them? Carry a scarf! And use it! If you aren't a scarf person, umbrellas or hats would work just fine. Though a scarf is a lot easier to carry around. Apart from the above, I also keep a small bottle of water at all times, some glucose tablets, a lip balm with SPF. What are your essentials for summer? Let me know in the comments below!